Rachel doesn't like to part with anything. ANYTHING!! I have to sneakily throw things away. Most of the time she never knows they suddenly went "missing!" 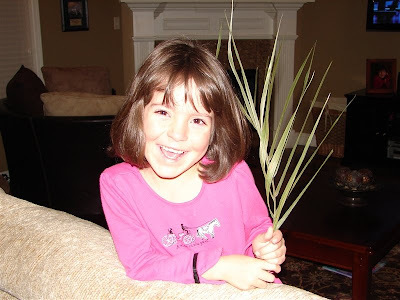 Well, one Sunday at church they gave all of the kids palm branches. REAL palm branches. Well, she and Rebekah have played with it for two weeks now. The branch is dry, crunchy and starting to grow something on it...not too sure what, but ICK!! Anyway, Jon Paul told her last night, "We need to throw this away." Yeah, probably shouldn't have told her. But, oh well. Immediately the tears start pouring out from her eyes. "NO NO NO!!! Don't throw it away! I remember when I got it!!" After ten minutes of explaining why we don't need to keep it anymore, she was still crying. So, I suggested we take a picture of it, so she can have the photo to remind her, instead of the dead, yucky branch. She was okay with that suggestion. So, above is the picture of her and the dead branch....which is now in the trash can. Oh my gosh, that sounds EXACTLY like me when I was little! And kinda like me today. I have wristbands and stuff from camp from 3 years ago because I know where it's from and it has sentimental value! And my mom has suggested taking pics of it too! How weird! !